Meg's Got Seoul: Korean Baseball-- exactly the same, only totally different. Korean Baseball-- exactly the same, only totally different. Ahhh, summer. The heat is upon us here in the land of the morning calm. Most of the time, that means endless hours of lamenting the fact that a "sunny day" in Seoul really means that the sky is just a lighter shade of gray than normal, sweltering in my poorly ventilated classroom and mentally raging at the Korean concept of "saving energy" by turning off the aircon and promptly OPENING ALL THE WINDOWS. Seriously, how does this make sense? But summer also means baseball. Having spent the past 6 years of my life in Boston, it is hard-wired into my brain that the two go hand in hand. 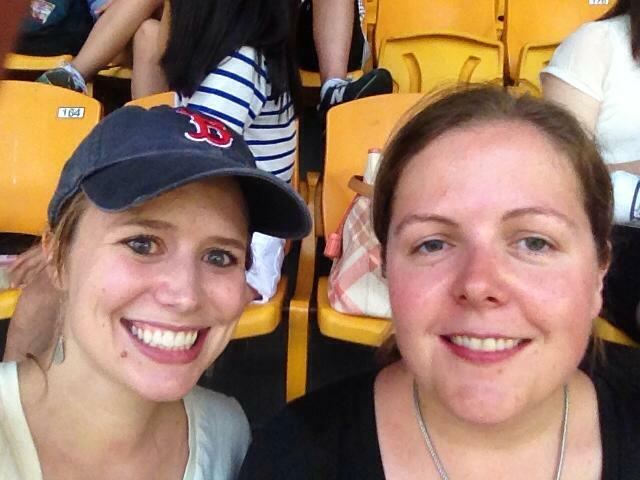 So, to ring in the first official day of summer last Friday, I took my English friend, "R", to a Korean baseball game. 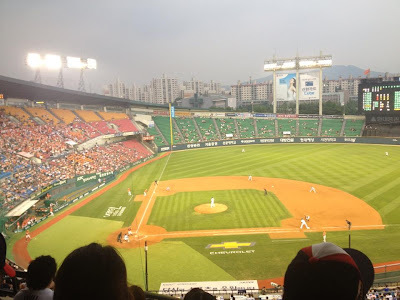 When I got out of the subway in front of the stadium and beheld the scores of vendors selling everything from dried squid to boxes of fried chicken that you could have delivered to your seat, I knew that this would be very different from American baseball. We didn't get to the stadium until the top of the 4th inning (clearly, the actual game was pretty low on our priorities). We also hadn't gotten tickets in advance. Instead, we just walked up to the ticket counter and bought two seats in the second-cheapest section for about 9 bucks each. If you're a Red Sox fan, please take this moment to pick your jaw up off the floor. Tickets in hand, R and I set about gathering supplies. In another profound difference from American baseball, K-baseball games are BYOB. We bought 4 beers from a seller out front, who put the beers into a little tinfoil bag and filled it with ice. They think of everything here. Next, we stopped to get some snacks. We could have gone for kimbap rolls or dried squid, but I opted for a corn dog instead. What can I say, I'm a traditionalist. We took our goodies to our seats and settled in for the game. As I mentioned, we arrived at the top of the 4th, so the game was already well underway. Seeing as this was R's first exposure to America's pastime, I had to give her a crash course in the rules of baseball. Anyone who knows my general attitude towards and knowledge of American sports will probably find this hilarious. I know. As we started watching, my suspicious were confirmed. This was not American baseball. We were not in Kansas anymore, Toto. First of all, I hate to say it, but the baseball just was not very good. Even I'd seen enough American baseball to realize this. However, this had a weird effect of making the crowd even more excited than an American baseball crowd. For example, when the home team batter hit a pop fly to left field, the home team crowd went crazy!! It was like they weren't even sure the fielder would catch it. I was so confused. I kept thinking, "I'm sorry, is this not a sure thing? Is there actually a chance that this guy won't catch this ball that is literally coming straight down at him?" Sure enough, he caught it, the batter was out, and that was the end of the inning. But this brings me to the fans. Oh, god, the fans. They were enthusiastic and coordinated in a way that I have never seen. There was actually a guy on a platform in the first row who was in charge of leading all the songs and cheers. Each player had a special song that had been composed just for him, each song had specific hand movements that fans enacted with their identical white thunder sticks, and each point of the game seemed to have a special cheer or chant. Please enjoy these videos. One thing I failed to capture was the cheerleaders. Yep. Korean baseball has cheerleaders. And they're shockingly scantily clad, considering how modest Korean society is as a whole. The other weird thing was that the fans would keep singing and chanting even when their player was up to bat! I ended up missing a lot of the plays by watching the singing and dancing because I (falsely) assumed that they would stop to let the pitcher throw the pitch. Despite all of this, I enjoyed myself immensely. As I explained to R, baseball games are not always about the game. It's about the atmosphere. The quality of baseball may have been lacking, but Koreans sure know how to create a fun game atmosphere. Those four beers certainly helped, too.